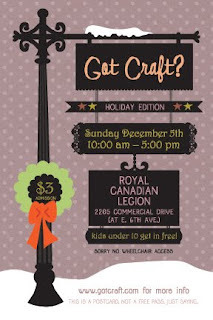 The holiday event on December 5th, 2010 marks our eighth show and fourth year running Got Craft. With our move overseas in February 2011, we decided to take a good look at the entire event and streamline it the best we can. Got Craft will continue to run in Vancouver with the help of a few key individiuals in the handmade community and with us returning to Vancouver for shows in May and December. One of the changes that we will be implementing in the new year is a juried process. This year, we received an incredible 190 applications for essentially 48 table spots. That's almost a 4 to 1 ratio. As organizers, we make sure that we offer a varied selection of items and a good balance of new vs. returning vendors to each show to keep attendees interested. Nobody wants to go to the same year after year. Unfortunately, as organizers, we also get the job of sending out the wait list emails to some amazing artists including some that had supported us back in 2004 when we first started out. To prepare for the jury process, we gathered up 3 people that were not necessarily involved in Got Craft, but were active in the handmade and design community of Vancouver to do a practice run. We talked, we reviewed, we snacked, we hummed and hawed, we provided feedback on what worked and what didn't. We did this for a good 8 hours, before I headed home to review the remaining applications and then to review again the ones that we went through during the day. There was a lot of back and forth, but we are pleased to finally announce the vendors participating in our holiday event! You can check out all of the images and their descriptions here. Check back soon for a guest post by one of our jury members discussing their experience! Thanks to Crafty Bastards for guiding us through our first jury process and answering all of my many questions! I can't wait! 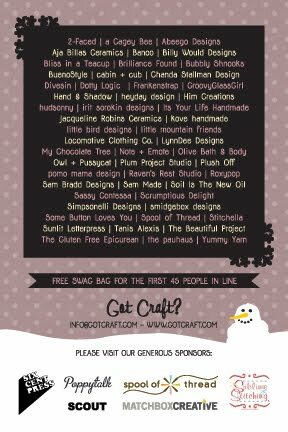 This craft market is my favourite of the year & the line up looks really amazing - well done! I will have to bring someone to help me sell my jewelry so I have time to look around and do plenty of shopping of my own. So happy and proud to be a part of Got Craft again!